The Kato is our latest hand made scissor designed specifically for the left handed hairdressers and barbers who are looking for comfort. 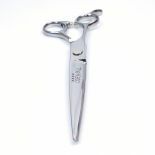 Made from the best Japanese Hitachi steel to give a super sharp edge which makes cutting effortless. Offset handle which is designed for your comfort as your thumb is working in a more natural position, you'll love The Kato Lefty. 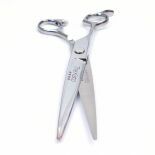 Scissor over comb, simple! Slicing, no problem! Chipping and blunt cutting, it works! Includes luxury scissor case, Matakki M1 Hair Texture razor, MT05c Carbon Cutting Comb, scissor oil, cleaning cloth, tension key and maintenance guide. Only available in size 7.0"